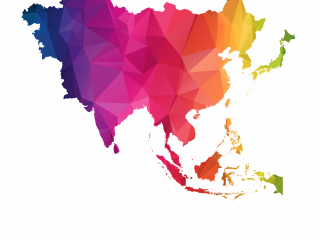 The highlight of the week is the Monetary Authority of Singapore’s (MAS) semi-annual statement, which will be accompanied by an advance estimate of GDP growth for 1Q18. The last MAS statement in October 2017, in which they referred to the phrase “a neutral policy stance is appropriate for an extended period” as the October 2016 guidance, triggered expectations of a return to tightening. The neutral MAS policy stance, or stable Singapore dollar nominal effective exchange rate (S$-NEER) over the policy horizon, has been in place since April 2016. The consensus for the upcoming statement is tilted toward a return to the “modest and gradual” S$-NEER appreciation path. However, we are sceptical because of the narrowly-driven growth, ultra-low inflation, and the threat of a global trade war. The consensus for 1Q18 GDP growth is 3.9% year-on-year, up from 3.6% in 4Q17. So far the evidence of last year’s economic strength continuing this year has been mixed. The growth of non-oil domestic exports slowed sharply, whereas manufacturing bounced in 2018. Both NODX and manufacturing are narrowly driven by semiconductors, and similar contrast as the headline NODX and manufacturing growths is observed for semiconductor exports and manufacturing. The headline and core CPI inflation of 0.2% YoY and 1.5% respectively in the first two months was within the official forecast for 2018. 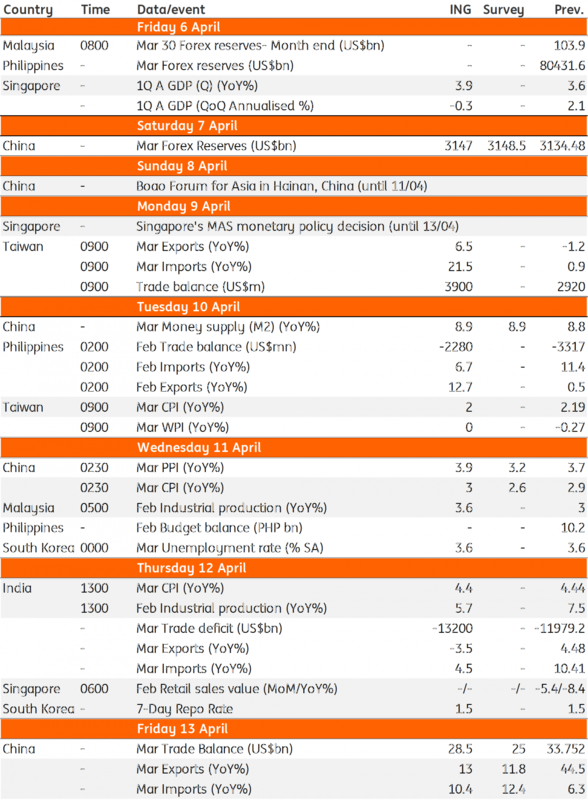 Korea's central bank will meet next Thursday (12 April) and release its quarterly Economic Outlook report. No one expects any change in policy, so the focus will be on the central bank’s assessment of the economy going forward. Steady exports and reduced geopolitical risk may have supported GDP growth around 3% in 1Q18 (data due 26 April), but inflation continued to grind lower. The central bank is concerned about strong currency hurting exports, while an intensified global trade wars pose further risk. As things stand, the chances of a 25bp Bank of Korea rate hike in 3Q18 are reduced. China’s March data dump begins. The trade data matters more in the current environment of a heated trade conflict with the US. While it’s too early for data to reveal the impact of tariffs that are yet to be implemented, the hit to sentiment from the mere announcement of tariffs cannot be underestimated. Perhaps positively for now due to frontloading of shipments in anticipation of the actual implementation. China’s exports surged 24% YoY in the first two months of the year, led by strong growth in shipments to the US by 25%. The hopes of this strength persisting rest on both sides coming to the table to resolve the tariff issue.